Today at the Windows 10 Devices Event, Microsoft revealed a few more details about the innovative AR headset Hololens. First thing's first, MS demonstrated a new demo named Project X-Ray. This demo is a game which turns every room in your house into a game level. The aim of the game is to stop robots invading your house using a wearable holographic gauntlet. 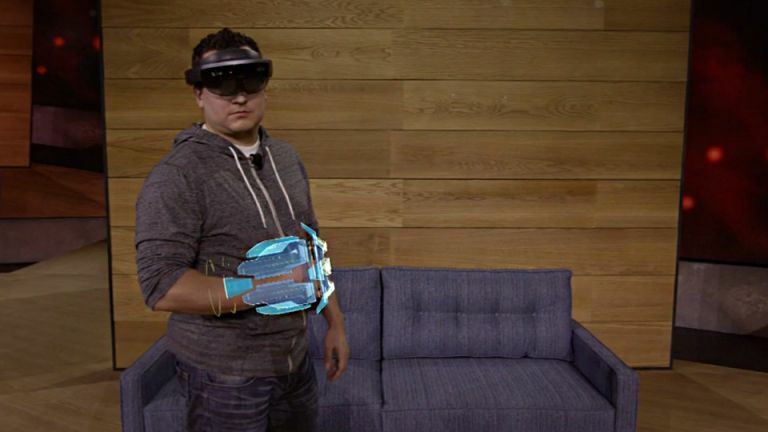 The Hololens immerses the user with spatial sounds, and robots which smash through your living room walls. Hololens knows where the walls, and your furniture is positioned, so the robots will use the environment to their advantage (likewise, you can do the same). Microsoft also provided us we a few specs, for example, we can, "see though HD lenses", and it will use the world's first holographic processing unit. The headset will run fully untethered, with no phone, PC, or wires required for it to work, which is a pretty big deal. Can't wait to get your hands on it? Microsoft is now taking applications from developers for Development Edition headsets. These early devices will begin shipping in Q1 of 2016. As for the cost? That'll be a whopping $3,000 (around £2,000). To put that in perspective, the first version of Oculus Rift DevKit 1 cost $300, although Rift also requires a fairly high-end PC, whereas Hololens doesn't.